The 3rd Southern General Hospital opened at the beginning of the war in the University Examination Schools. It was one of twenty three Territorial Force general hospitals, housed in converted civilian buildings in key locations, selected for this purpose before hostilities commenced. The general hospitals acted as district ‘hubs’, treating the wounded who could then be moved to auxiliary hospitals nearby to complete their convalescence. 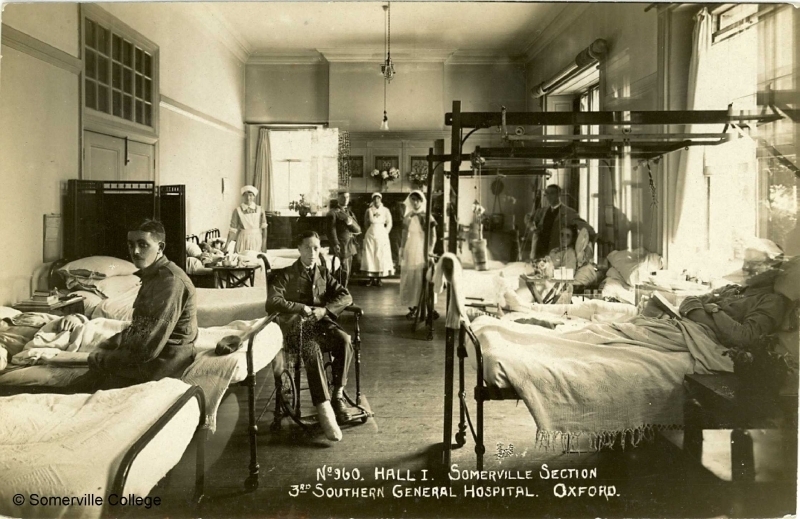 The 3rd Southern General eventually expanded to occupy at least 10 sites in and around Oxford, including the Cowley Road workhouse, the Town Hall and the Oxford Masonic Buildings on the High. Somerville’s proximity to the Radcliffe Infirmary made it an obvious choice when the 3rd Southern General Hospital needed to expand; stretcher access to the Infirmary’s operating theatres was created by knocking a hole in the north wall of the College. Initially the Somerville Section took in all ranks, with the Maitland Building reserved for officers, but it was soon decided that the nature of the accommodation available in the College – small rooms in large number – was best suited to use for officers only. As promised in Colonel Ranking’s letter to Miss Penrose (see March blog), attempts were made to protect the buildings; at first, the Hall was used as a ward, with a bathroom built into one corner and its oak floor and panelling preserved in places under deal cladding. It later reverted to use as a dining room and Somervillian Constance Savery was to recall a notice which had been put up in the Hall: “Officers are requested not to throw custard at the walls”. Privileges denied to the students were allowed to the patients; “In the old days you paid a threepenny fine per court if you crossed the tennis lawns in heeled shoes, today these same lawns are given up to cricket and crutches. The garden is as great a blessing to the wounded as it was to us.” (SSA Annual Report, 1915). 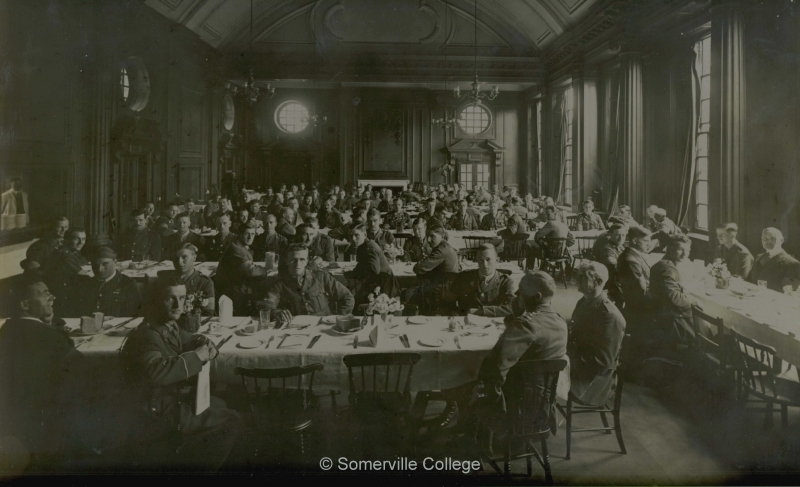 Students sought to assist those convalescing in Somerville by organising a ‘comforts’ table (for magazines, stamps and stationery), setting up a sewing party to make shirts for the discharged soldiers and wheeling out the wounded in their Bath chairs. Visiting the College shortly before she left to begin nursing, Vera Brittain thought Somerville was “much better as a Hospital than a College. The Hall and the JCR make fine wards, and it is all so sweet and clean and fresh that it must be quite a joy to be convalescent here.” (Chronicle of Youth, 15th June 1915). September 1918: Lorimer of the F.O.